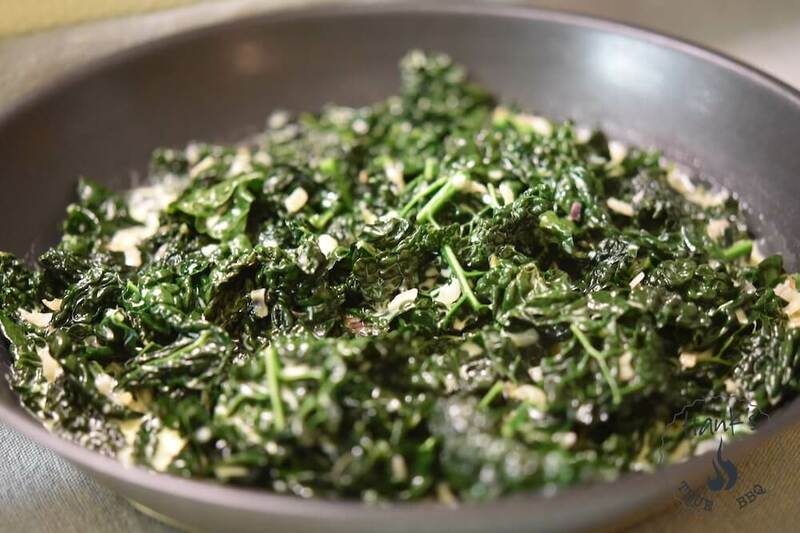 Tuscan kale has a gentle flavor, and we’re combining it with cream and parmesan cheese for a delicious side dish. Start by rinsing the kale with cold water. Cut away the stems. This is easiest done by placing each kale leaf flat on the cutting board, and then cut along each side of the stem. Now bunch the leaves together and chop them up 1 inch wide. Chop the shallots finely and fry them gently in butter for a few minutes. Add the crushed garlic clove, and then the kale, and fry it all gently on medium heat. Flip/turn a few times and let the kale shrink. Add the cream and flip/turn a few times to make sure all the kale is gently simmered in the frying pan for a few minutes. Add the parmesan cheese, stir and then serve.